A few of the Committee are away this month but Barry was still on hand to update everyone on what’s happening in the Chapter. Two great things to get us underway – the Christmas Party and the Heart & Soul Rally! The Christmas Party is a Chapter-only event, at Nissan SLC on 17 December 2016. However, we need to sell a hundred tickets to make it happen. So, get in there now and your tickets! Trish has them. Tickets for the Heart & Soul Rally go on sale on 31 October at midnight! Prices are exactly the same as last year, with two ticket types. The chapter website is the new place to buy your tickets: www.geordiehog.com/rally. All ticket sales are online this year. John and Ruth laid a wreath at the Ride to the Wall. Many thanks to them and everyone who travelled down to the Arboretum. Our Ladies of Harley held a Macmillan Coffee Morning at Jennings Harley-Davidson Gateshead to coincide with the launch of the H-D 2017 models. It was a great event and raised £313.50. Jennings Harley-Davidson Gateshead is holding a Halloween party, Harley-ween, on 29 October. All volunteers are welcome from 10.00 am to get the place decked out. There’ll be food and music in the afternoon, between 2.00 pm and 6.00 pm. Steve and the Road Crew are planning things for the Santa Ride. It’s going to be great! It’s Chippa’s Last Ride on Saturday and people should meet at 9.30 am, for a 9.45 am off, at Marsden Lea car park. The funeral is at 10.30 am at South Shields Crematorium. Everyone is welcome at the White Horse Pub, in South Shields, after. A raffle of Steven Hardy’s motorcycle-related items took place recently and raised £415.00. This will go to North East Blood Bikes and GNAA. Mandy said that the Chapter now had 217 members! Also, remember that Chapter membership is dependent on maintaining your H.O.G. membership, so check your renewal dates. You should get a reminder from H.O.G., and you’ll get one from Mandy, but keep your eyes peeled so that your membership doesn’t lapse. There is no official Chapter Ride in October, so Greg and Dave have arranged a Treasure Hunt for everyone. Get down to Jennings Harley-Davidson Gateshead between 10.30 am and 12.30 pm to register and get underway! 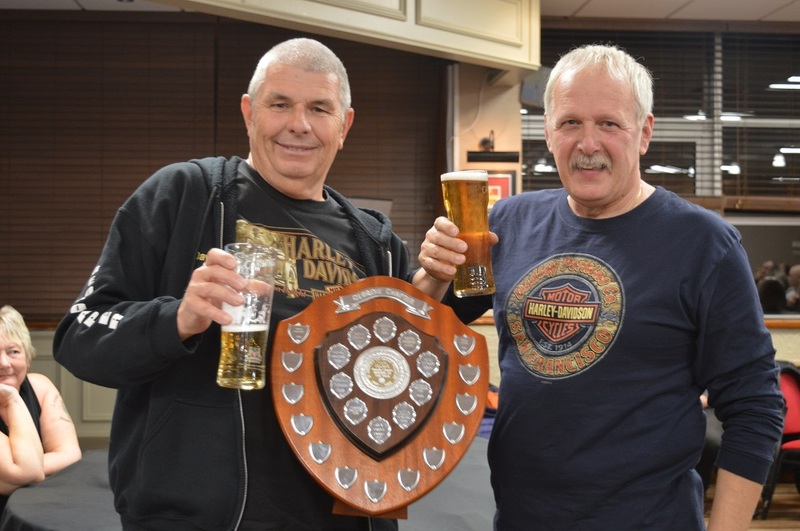 There’s some great prizes: a £50 H-D voucher donated by the Jennings, a Heart & Soul Rally ticket donated by the Chapter and a bottle of Jack Daniels donated by Hadrian V-Twin Tours. What’s not to like there?!? Tony, Ann, Dave and Jo took home the prizes from the raffle. Well done to everyone. The next Chapter meeting is 3 November 2016 at 19.30 pm. See you all there. Barry led the plaudits for the recent Thunder in the Glens rally. Chapter members really boosted the overall attendance, with our friends at Dunedin putting on a great show for everyone. The ride-out was superb. Estimates varied, but George reckoned there was about 2,000 bikes and trikes. Which is simply stunning. It took ages to leave the venue and nearly an hour and a half to all park in Grantown-on-Spey. Have a look on our flickr pages for some photos, here. Coming up soon, there’s the season-closer at Circus Maximus and European Bike Week at Faaker See, Austria. The Christmas Party is ready! It’s on 17 December at Nissan SLC. We have exclusive use of the venue but need to sell one hundred tickets to make it work. Ticket prices are £5.00 for chapter members and £15.00 for non-members. Sounds like a bargain! It’s the same format as last year, with a delicious dinner, a band and a disco thereafter. We’ve tried very hard to find the winner of the main raffle prize from the Heart & Soul Rally. We’ve now placed a note on our open Facebook page. It will remain for thirty days, after which the prize will be re-raffled. The September Chapter Ride is to The Lakes Distillery, on 11 September. 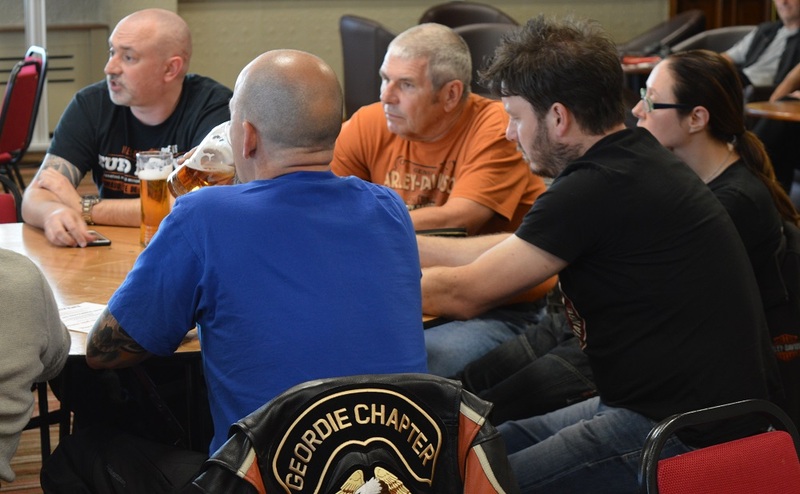 Meet at Jennings Harley-Davidson Gateshead at 9.00 am, for a 9.30 am departure. It’s a 190-mile round-trip. The annual Chapter BBQ at Ingram Valley is on 18 September. Meet at Jennings Harley-Davidson Gateshead for 10.30 am, for an 11.00 am off. Peter reminded everyone to take their own BBQ and food, and to remember not to burn the grass! Mandy advises that there are now 212 members in the Chapter, with two new applications received during the meeting. Great news! Dawn will take all the recent helpful comments on board in planning the 2017 Heart & Soul Rally. Ruth is arranging an L.O.H. Macmillan event, either at Jennings Harley-Davidson Gateshead or a Chapter meeting. Watch this space. Raffle: the winners are Lesley, Dave, Lesley and Tony. Hope everyone has a great time at the forthcoming events. See you all at the next meeting on 6 October, at 7.30 pm. Peter was in the chair again for last night’s Chapter Meeting. There were only a few updates from the Committee, so it was a fairly speedy round-up. The Road Crew kindly put on Newbie Ride, round the local roads, although there was only a small attendance for Chapter members. Peter started by mentioning the turn-out by everyone to the funeral of Woz, landlord of the Penny Gill, on Wednesday. Peter told us that June will be carrying on with the pub and everyone is welcome at any time. We may have a Chapter ride up there soon. 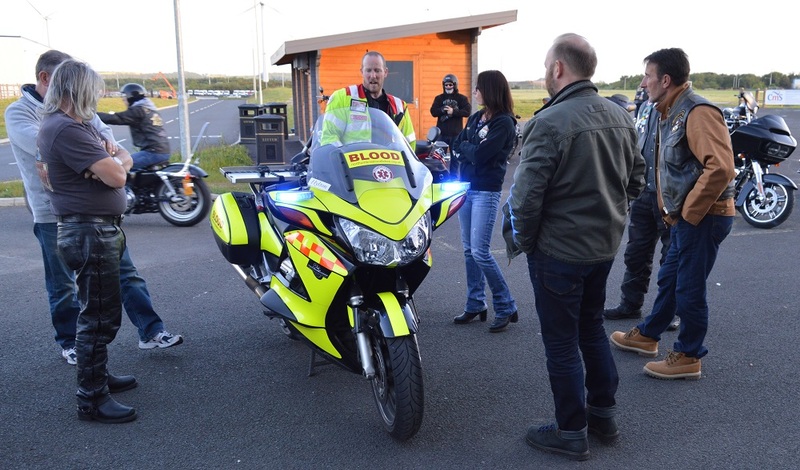 There was an update on the presentation by Northumbria Blood Bikes at the last Chapter meeting. We raised £140.00, which is great news. After the meeting, John went along to meet everyone at NBB. They assessed him and he undertook his first evening on call on Wednesday. A fantastic achievement, well done John! Al has stepped down from the role of Head Road Captain, and Steve replaces him. Dave remains as Assistant Head Road Captain. Both will be in charge for the monthly Chapter ride-out on Sunday. We’re off to Jedburgh, with further details on the website. Peter gave us a brief overview of what’s what for events for July and August. We’ve posted everything on the website Events Calendar and keep an eye out for updates etc. on our Facebook group or by text, directly from Peter. 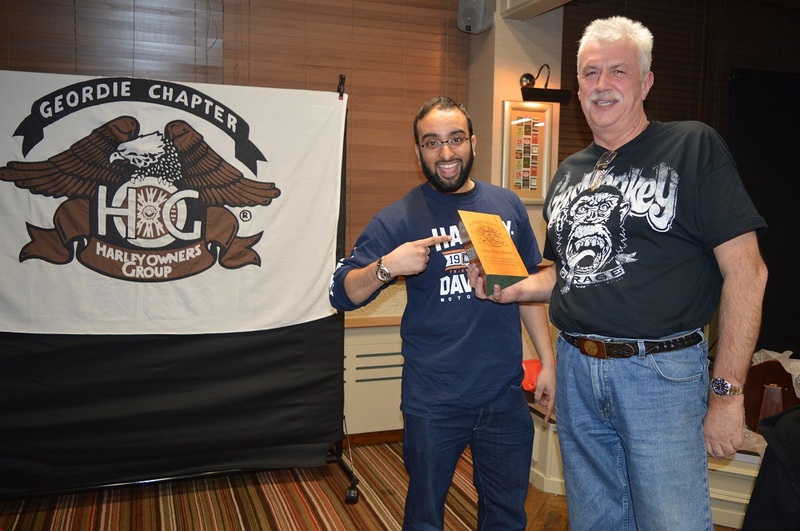 Ray went along to the HA clubhouse for the North East Coalition of Motorcycle Clubs’ meeting. Highlights for July include the Life’s a Pitch rally with the Draconians MCC (Derwenthaugh Park, 15-17.7), The Gathering with the North Men MCC (19-21.8) and an Open Night at The Penny Gill with the Brigantes’ Brotherhood (23.7). Get along if you can. Mandy gave us a quick update on members and we now have 194 in the Geordie Chapter, which is great news! Grant and Sam were at the meeting too and the new dealership, Gateshead Harley-Davidson, opens this Saturday at half nine! James has posted on Facebook about meeting up at Westerhope for a ride-in together, if anyone is interested. See you all there! There’ll be an official opening on 23.7 too. Lyn has some rather swanky leather Geordie Chapter belts on sale now, skilfully crafted by Simon. £35.00, made to order, so get in quickly. Paul McPherson updated the details of the November charity event. Bessie and the Zinc Buckets and Charlotte Yanni will be providing the entertainment and it’s on at the Lancastrian Suite on 4.11. Click here for a poster about the event. Garry, Fay, Paul and Shaun all shared the spoils from the raffle. Finally, Lyn told us that it’s Ray’s birthday on Friday, and he’s the oldest, and wisest (!?! ), member of the Chapter. A very happy birthday to Ray! Peter was in the chair for last night’s Chapter Meeting and we fairly whipped through proceedings, with only a few updates from the Committee along the way. The Road Crew kindly put on Newbie Ride, round the local roads, for our new riders, riders who haven’t ridden in a group before and riders wanted to brush up on their group-riding skills. Everyone had a great time. June and July are always busy months for Chapter events and Peter gave us a brief overview of what’s what. We’ve posted everything on the website Events Calendar and keep an eye out for updates etc. on our Facebook group or by text, directly from Peter. 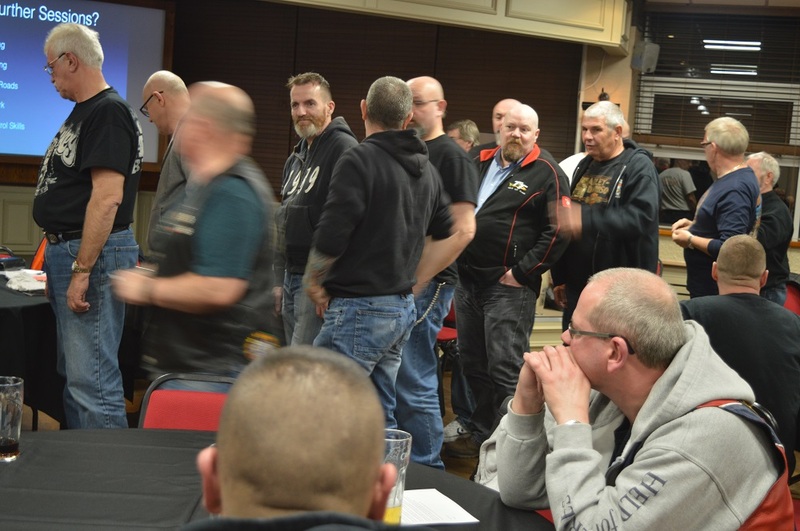 Ray was away having a great time at Benelux, so Peter and Barry went along to the HA clubhouse for the North East Coalition of Motorcycle Clubs’ meeting. We’re hoping to get a new page on the website showing all these events. In the meantime, highlights for June and July include the Badlanders MCC Armed Forces Day (Bents Park, 25.6), Badlanders MCC Party (clubhouse, 29.6) and the Sober up the Dragon rally with the Dragonslayers MCC (Morpeth, 8-10.7). Get along if you can. Mandy gave us a quick update on members and we now have 191 in the Geordie Chapter, which is great news! Dawn is looking for some volunteers to look after the Registration Tent at the Heart & Soul Rally during the ride-out on Saturday. If you’re not going on the ride-out and would like to help, get in touch with Dawn. James provided an update on the June Chapter Ride, which is this Sunday, starting from Washington Motorway Services, A1 (southbound). All the details are on the website and, as usual, Peter will keep everyone updated if there are last-minute changes. The weather is looking pretty good for this one, so fingers crossed! Grant was at the meeting too, and it looks like the new dealership will definitely be open on 4.7. There’ll be more information in due course, but get along if you can. Hopefully, there’ll be a big opening PARTY soon! Paul McPherson gave us some early details of an event in November 2016, much like the Stand up for Scarlet event that he organised last year. Everything will be pretty similar, with The Buckets and Charlotte Yanni providing the entertainment and The Fed (or Lancastrian Suite, if you prefer … !) providing the curry. The chosen beneficiaries are Harley Stallard (for a new summer house) and Gibside School. There’ll be more details closer to the time, with flyers on the way soon, and this year it will be a movie and TV fancy dress theme. This was a great event in 2015 and well-attended by the Chapter. You may all remember Shaun’s amazing Hallowe’en outfit too. Finally, we held a collection for Northumbria Blood Bikes, who gave us an excellent presentation on what they do. Many of us didn’t realise that it’s funded completely by donations and everyone gives their time free. A very worthwhile cause. If you would like to read more about them, or get involved, have a look at their website, here. There was lots to cover at April’s Chapter Meeting, with our first CRAGG run only days away. This should be great a weekend with the Clyde Valley, Red Rose and Geordie Chapters over in Gretna. It’s the first time we’ve done it, so everyone’s looking forward to a fantastic time. Peter will issue some details, in due course, about meeting up beforehand. There have been a few comments about cancelling the Haggis Run. It’s always a great shame when we have to cancel rides at any time of the year, but we live in a strange climate which keeps bringing us rain! The primary factor we have in mind when we cancel rides is safety, and it can be very difficult to rearrange events at short notice. Please bear with us. Derek gave us a few good words on the Ride To The Wall event (RTTW), later in the year. Quite a few of our members go on this and we’ve posted it in the Chapter events calendar. The event has grown considerably since it started in 2008 and there are now eleven starting points to stagger arrival at the National Memorial Arboretum. Have a look at the RTTW website, here, if you’d like to find out more. John, Bev and Andy are in the chair for our first Chapter Ride of 2016 – the Air Ambulance Crusade Ride. The start point is Lumley Castle then off to Alston and back to Durham/Tees Valley Airport. We’ll be collecting for the Great North Air Ambulance service during the ride and everyone is encouraged to get their Crusade outfits on! Have a look at the Chapter website for more details. Greg has got the Wednesday Night Ride-outs underway. Get along if you get a chance – he did a great write up for the website a while back. NB: these rides are very weather dependent – keep an eye on your phones. Peter will update everyone via text if there are any changes or last-minute alterations. Finally, please contribute your touring tales, news, stories or photos for the website and Facebook pages. There are several ways to do this but the quickest is to email your items to: GeordieHOG News or use news@geordiehog.com. We will always check back with you before we publish anything. It only seems like a couple of weeks since we were at Nissan SLC for our AGM, but we had another great turn-out for our March Chapter meeting. We’ve got a few new Committee members to welcome aboard, resulting from recent appointments and elections. We’ve got Ruth Neal and Trish Gillespie as L.O.H. Officers working with Dawn Beattie. Each has a defined role promoting the good work of L.O.H. Ray Hales took up the role of Coalition Officer and Chris Neal as Chapter Photographer. Chris is working alongside Rob in this role. We’ll be getting a new page on the website soon for all the Coalition news and events. Hopefully, we can also get some more members along to the meetings that Ray and Lesley attend. Mandy is collecting subs from everyone for 2016. Make sure you get yours in early: the closing date for all renewals is 31 March 2016. Al said a few words about the Road Crew, the fabulous team that keep us all safe when we’re out and about. You’ll have seen from these pages that they all went through the First Aid training recently. This is for everyone’s benefit, if there’s ever a problem, or we encounter a problem, when we’re riding. Make sure you ask them any questions that you may have on any aspect of riding, in a group or otherwise, preferably before we set off. Don’t forget, they are there for our direction and safety. Rally tickets are selling well, so make sure you’ve got yours, ready for another great event in July. Dawn is looking for people to help on the day. If you’d like to help, get in touch with Dawn directly, so she can keep an eye on who’s doing what. Finally, we’ve got our first ride-out later this month – see you all at the Haggis Ride on 26 March 2016. All the details are on the website and Peter will be keeping everyone informed via text too. We had a great Annual General Meeting (AGM) at Nissan SLC yesterday. More than 100 people packed into the room to catch up with what’s going on and to vote for our new Committee members. We’ve got the UK and Ireland Chapter Challenge forms ready for the new riding season, in this case from 27.2 to 30.11. Click here for the form. As we don’t have a sponsoring dealer right now, fill it in with all your details, take a photo of your odometer and bring it to the next Chapter meeting. We’ll get them all endorsed at once. If you can’t get to the meeting, then get in touch through the Contact Us form on the website. John Johnston introduced Michael Goodwin from Northumbria Advanced Motorcyclists, who gave us an excellent talk on what they do to promote safety and enhanced riding skills among motorcyclists. The link to their website is on our links page, if you would like to know more about them. NAM provides informal one-to-one training and mentoring to new members. Sohail Kahn, Director at Jennings Harley-Davidson, gave us an update on the new dealership, with an expected opening sometime in April 2016. Fantastic news for everyone in Geordie Chapter! Sohail introduced Sam Roberts who will be the dealer’s H.O.G. Experience Manager. This is essentially an interface between the Chapter, H.O.G. and Jennings. Sohail mentioned that Jennings’ chosen charity for 2016 is the Great North Air Ambulance. The North of England Children’s Cancer Research team sent a thank-you letter to the Chapter, thanking everyone for the gifts and donations. This was part of our Santa Ride in December 2015. Click here for letter. 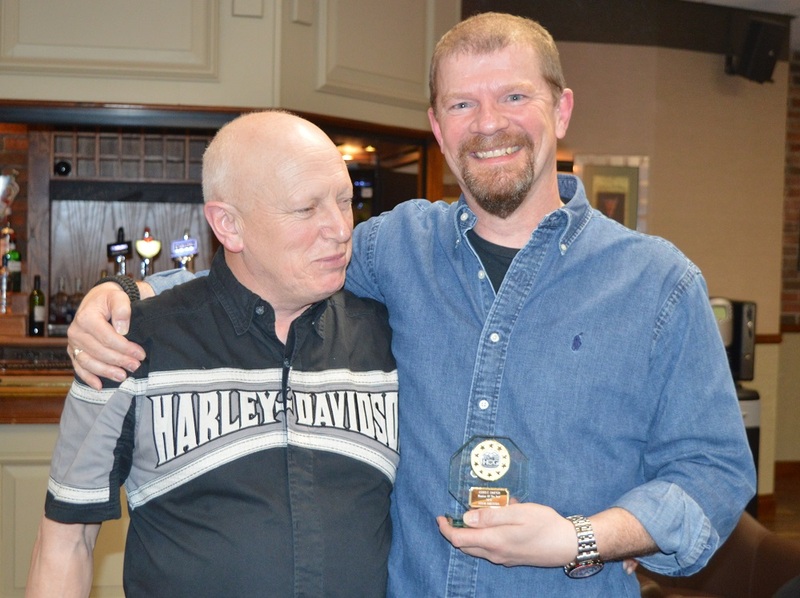 Member of the Year award (Director): presented to Greg Holmes and Dave Cook for their fantastic support to the Road Crew and ride-planning. Very well done to both of you. Outstanding Achievement Award: presented to our Webmaster, Robin Anderson, in recognition of his work in getting our new website up and running. Member of the Year (Chapter): also presented to our Webmaster, Robin Anderson. Well done, Robin! Finally, it was time for the Chapter to vote for new Committee members – the Assistant Director and second Ladies of Harley Officer positions. Peter Currie was the winner in the Assistant Director vote, well done Peter. The second L.O.H. Officer position was a tie with 47 people voting for Trish and 47 people voting for Ruth. We’ll take this up with Sohail Kahn to see how to resolve this – watch this space for more details.